We do not get to choose our own nicknames--at least not the ones that stick. Our nicknames are chosen for us. Rob Leatham's nickname is the Great One, and he did not pick it. Over the last 30 years, between IDPA and IPSC shooting, the NRA Bianchi Cup, the Steel Challenge and the Single Stack Classic, Rob Leatham has won more than 56 national and five world championship titles using just about every type of handgun made. To compete at the highest level of any sport, the will to win is at least as important as the skill needed to do so. "I think that I should win every single time I walk to the line because of the support I have, and the program that's in place for me that allows me to do what most of these guys don't get to do," Leatham, pro shooter for Springfield Armory says. "I really, really believe I should win every single event I enter, and that's how I've always felt. And because of that, once I get on the line, whether I'm trying to prove anything or not, it's really a battle for me. I'm not shooting for my sponsors, or my family or to impress other people, it's really for me. Even now, what do I have to prove? I have to prove to me that I'm still good. "I can't remember not shooting," Leatham says of his childhood. "My family, that's what we did on the weekends, we went shooting." Leatham likes to tell the story of how he rode his bike around, collecting wheelweights, which his late father, Nyle, then melted and cast into bullets for their revolvers. Drive, natural talent and the will to win aside, Leatham knows he was as much a product of his lucky environment and timing as anything. "My dad was a photojournalist for the Arizona Republic. Mike Dillon and my dad were buddies. We went up to Gunsite to do a story on this guy who was starting this shooting thing up there. We met Jeff Cooper and went out and shot on the range and that item right there that day probably made me more enthusiastic about shooting than anything I'd ever done. It was the first time I'd ever shot in front of anyone other than family, and I loved it--the showmanship and the desire to compete came out there. "Shortly thereafter I shot a local tournament at the Mesa PD range--shooting revolvers, you know, because autos don't work," he added with a wink, "and from that point on all I ever cared about was shooting. I met Brian Enos, and we started shooting together and Mike Dillon started building loading machines--I was in the right place at the right time. I am a product of external opportunity." Leatham shot .22s a lot as a kid and recommends them as a cheap practice alternative for those people who still have to pay for their own ammunition. "Airsoft is great for practice too," he adds. "I used to think it was a joke. Now I have a whole bunch of 'em. Airsoft guns are so good now that some of them will shoot an inch group at 10 yards. As far as learning the basic fundamentals of gun manipulation it's great. I think you can learn everything except recoil control shooting airsoft." Even with a nearly unlimited sponsor-provided supply of ammunition, Leatham still dry-fires for practice. "I like to describe it more as playing with the guns," he explains. "I find it difficult to be at home and not have guns all over the place. I don't want them locked up in the safe, I want them out so I can play with them, because I think that's critical in having a basic familiarity with the guns, so when you draw it doesn't feel foreign to you." Leatham has a unique perspective on competitive shooting and its relationship to self defense training. "Most studies on the defensive use of the handgun quote six to eight feet distance in a gunfight, and two to three shots. The things we do in competitive shooting are not realistic whatsoever. We've made it much harder, as far as the shooting ability needed, in order to make the test more difficult. 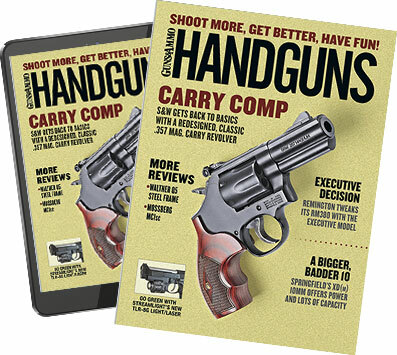 "All you learn in competition is the ability to work under stress, because the actual shooting that we're doing is so ridiculously hard compared to what is even remotely conceivable in an actual gunfight. That said, the average law enforcement officer doesn't shoot enough to be competent to the level that I think they should want to be. However, I find it difficult to judge them. They have so many other things to consider when they're working. All I have to do when I step to the line is think about the shooting."